Mr and Mrs Bird have been living the high life. 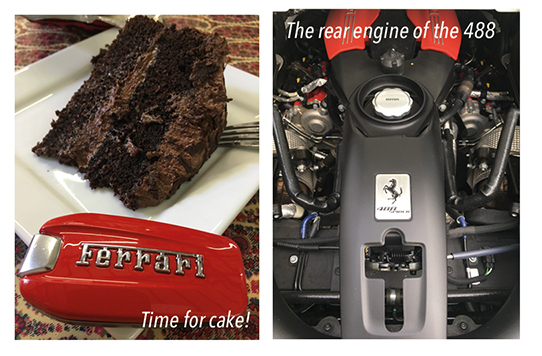 Crab ravioli, Welsh beef and chocolate cake – they certainly know how to live – and of course there was the Ferrari too. I’m writing this just before the Autumn Equinox, but publishing schedules being what they are, you’ll be reading it no-doubt long after the clocks have been turned back; the nights will be darker and those dreaded and all-too cheery (cheesy?) “Holidays are coming” adverts will probably be on telly. Apologies in advance. Please accept my apologies too for what follows: A tale of a weekend of pure self-indulgence. In a bid to cling on to a little of “the last of the summer wine” we – that’s Mrs B and I – decided we’d spend an Italian flavoured weekend, taking in the scenery, touring the lakes and mountains, eating fine food, and driving an opened-topped sports-car – in Mid-Wales. What? No, not Italy. The budget didn’t run that far! Nevertheless, that didn’t mean we gave up on all the luxuries. 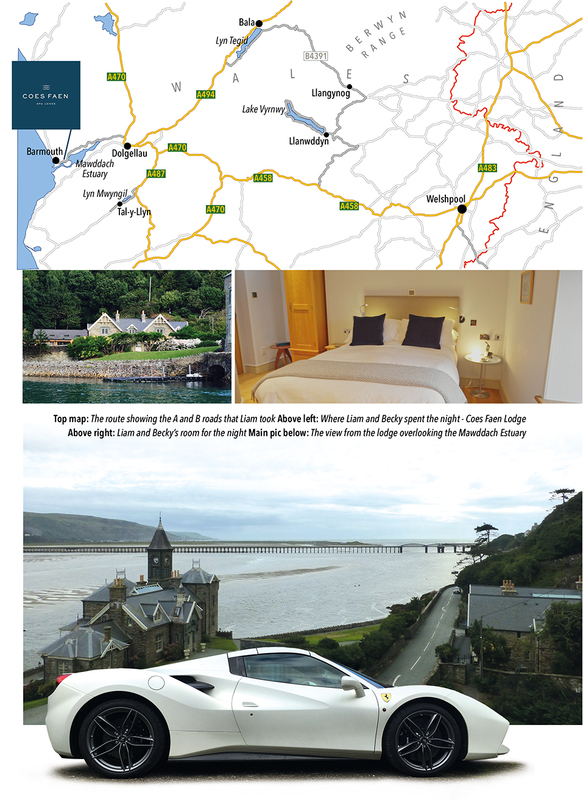 A few months ago we received a rather nice invitation from fellow Welsh Motoring Writers members Sara Parry-Jones and her husband Richard, asking us if we’d like to stay at Coes Faen, their beautifully appointed lodge house B&B on the Mawddach Estuary. Hmm… Arrive in something fast you say… Brilliant driving roads… It’s difficult to resist such things. And fortunately, I just happen to know someone at Ferrari. Fast forward a few weeks and after a Friday schlep to Slough and back from our place in The Shropshire Marches – Ferrari don’t deliver, you must always go to them – Rebecca and I found ourselves stuffing overnight bags into the surprisingly accommodating luggage compartment of a white Ferrari 488 Spider, complete with folding hard-top, a seven speed automatic gearbox with F1 style flappy paddles, and a little switch on its carbon fibre steering wheel called a manettino that has settings that read, among other things, Wet, Sport and Race. 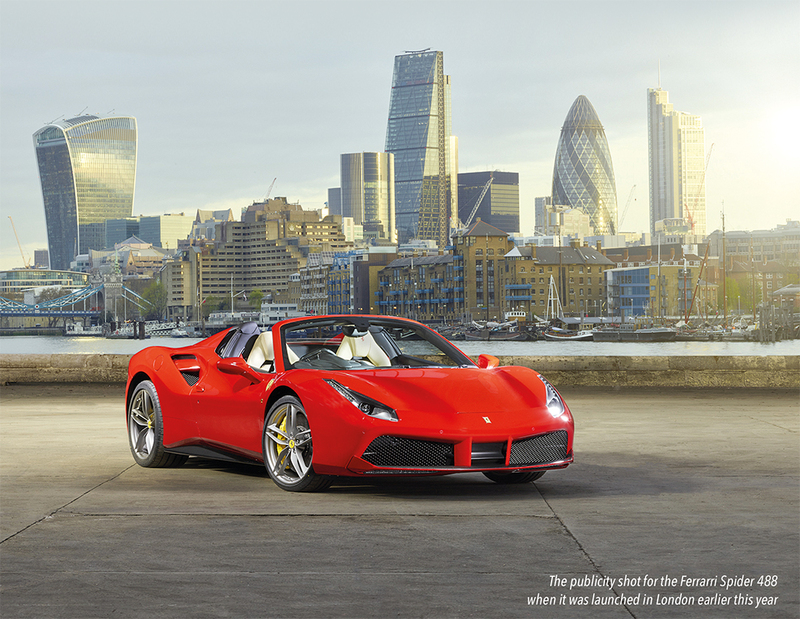 Now, if you’re not familiar with your Ferraris, the 488 Spider, or GTS in Ferrari-speak, is the latest incarnation of the classic two-seater, rear-engined V8 Ferrari, and a car that can trace its roots back the beautiful 308 GTS (which if you’re of a certain age, you’ll no-doubt remember from both the Athena poster and of course Magnum P.I). Power, these days all 660bhp if it still comes courtesy of a mid-mounted V8 engine – albeit now a turbo-charged one; like its forebears a two seater Ferrari is still very much the head-turner it always was; and as we were about to discover, a 488 GTS proves to be an undeniably enjoyable means of covering ground very swiftly on your way to the Welsh Coast. Needless to say we didn’t take the direct route. Our quest to see some of the best scenery Mid Wales has to offer took us via the rolling hills of the Marches and what was once Montgomeryshire, past Powys Castle near Welshpool and up to Lake Vyrnwy. A brief stop then followed – for chocolate cake in the little café that stands beneath what was the first large scale dam to be built in the United Kingdom – after which, suitably stuffed and following the 12 mile circumnavigation of what surely must be one of the most picturesque man-made sites in Wales, we headed further west, the 488’s exhausts echoing off the Welsh Slate walls as we once again crossed over the top of the dam. Destination: The Berwyns. “Which way did you come?” asked Richard later, between courses of a delicious Welsh and Italian chacuterie board big enough to double as a light-lunch, closely followed a superbly light Aberdaron-caught crab ravioli. And as someone Autocar magazine once described as “one of the world’s leading automotive engineers”, you know he has more than just a passing interest; I doubt there’s an inch of tarmac in Wales he doesn’t know intimately. My reply, “From Llangynog to Bala, and then down to Dolgellau” was greeted with a nod of knowing approval. “That’s the road where we honed the adaptive damping on the Aston Martin DB11”. In such knowledgeable and experienced company how exactly does one answer? I’m afraid I can’t give the full engineer’s report. But, what I do know is, a smooth twisty B Road such as the B4391 suits a 488 Spider very well indeed. There’s performance in abundance of course: 560lbft of torque and the capability of hitting 62mph in 3 seconds dead. The steep climb up from Llangynog was thus no trouble at all. That said the 488 doesn’t wail through the gears like its predecessor, the 458 did. 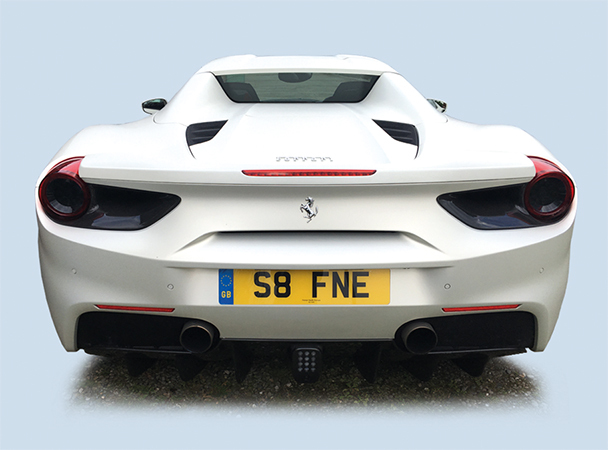 It’s the turbo-chargers you see, they may add that welcome extra low-down shove, but they do soften the sonorous trademark Ferrari multi-cylinder symphony a little. Nevertheless, at least the automatic throttle-blipping in Race mode makes you sound like a pro, especially when you find yourself quickly changing down for the descent into Bala. 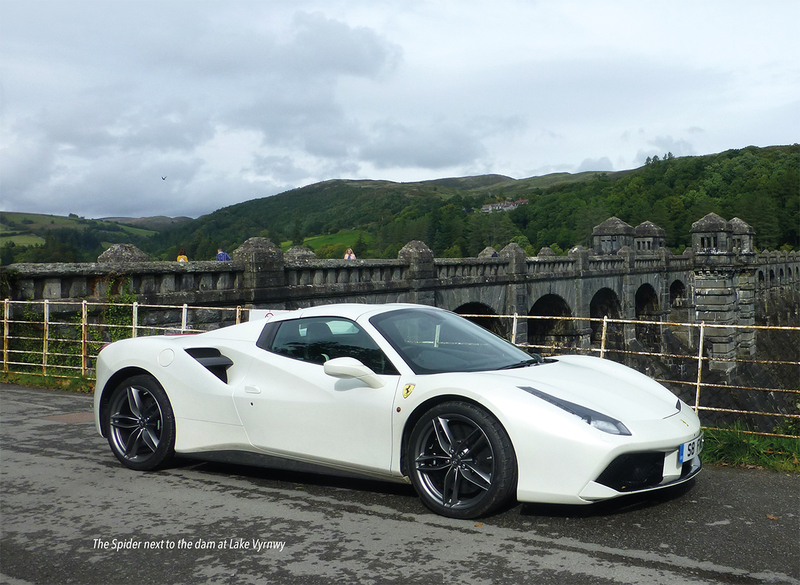 The traction control too, is just generous enough to let you wag the 488’s tail a little as you exit the hairpin near Pale Hall. Another left, another lake. The shores of Llyn Tegid lie next to theA494, the road that leads south-west towards Dolgellau. A left again at the roundabout soon after, picks-up up the road towards Barmouth, which skirts the stunning Mawddach estuary complete with its wooden viaduct, and leads on to Coes Faen. After an afternoon spent on epic roads through epic scenery, and in an equally epic car, it was time to relax a little. Good company, good conversation and excellent food – the locally reared Welsh steak was divine – were our reward. The weather on the other hand wasn’t. Overnight it turned typically Welsh. More self-indulgence perhaps. But surely, it would’ve been rude not to have taken a look? Many thanks to Jason and everyone at Ferrari North Europe for the loan of the 488 Spider.